I laughed when I read on a website about 'birthday freebies'. If you join the Blizzard Club, you get a coupon like this every month (good for a couple of weeks) and it is buy a medium and then you get one free. We did! On the way back to town, Jon took a different road. He also stopped to pick up a floor mat that was lying akimbo on the asphalt. It was in really good shape, too! I took a photo of the setting sun. Along Dry Creek, there are several farms. We were entertained by the lambs who have been born recently. They are such hilarious creatures at this age (before they turn into stubborn annoyances). They were bleating and frolicking and seemed to be having a great time celebrating being alive. The ewes weren't as impressed. I've always like this old grain elevator and Jon took several photos of it for me. This isn't my favorite one, but it shows the whole building. The ghosts of previous harvests were blowing in the weeds before it-I'd like to go inside, but am pretty sure it wouldn't be very safe. Yesterday, a favorite FB friend (one I got to meet in real life) died of cancer. This ice cream run was in honor of him, really. He loved ice cream, we met at DQ before one of his chemo treatments. 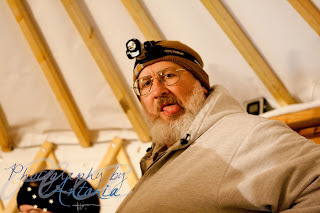 Alaska Bob was a larger than life man who wielded a keen wit and had a great eye for photography. He'll be missed by so many of us. Toni wrote about him on her blog, I hope you visit it as we celebrate Alaska Bob.